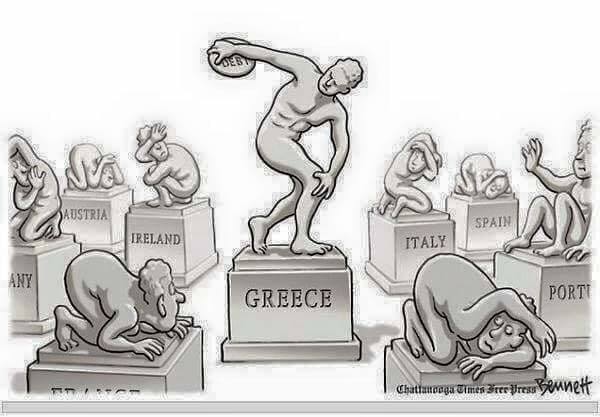 For all those who felt it was tactically correct to call for a NO vote in the Greek referendum. The referendum trap was sprung twice. The first, when the national-reformist Tsipras inevitably found he could not carry out his election promises. Faced with the ferocious demands of the Troika (before the debt can be paid, you have to make the necessary reforms such as increase VAT, reform tax collection and cut pensions. In short, carry on the devastating austerity policy before you can ask for new loans), Tsipras at first attempted to negotiate a lowering of the demands. However this was rejected by his own party, so all he could do was throw the hot potato into the hands of the Greek electorate in the form of a rhetorical referendum: "YES or NO to the Troika’s austerity policy". Deceiving the Greek proletariat, but not just them, he claimed a No victory would give him the best political weapons to counter the sacrifices demanded and better safeguard the conditions of pensioners and workers at the point of collapse. The second time came when the NO victory left things as they were before. However it acted as a safety valve even for the angriest elements, who at the most extreme did not vote, (3,693.889, slightly higher than those who voted NO). And, despite playing upon identity politics it did not frighten the controllers of the liquidity crisis. In fact, the No did not mean no to austerity. It meant only a re-opening of the stalled debate about how to cut and over what time period the Greek working class would have to go through the nth round of austerity. In practice, as in the game of Monopoly, we have returned to the start with nothing changed on the question of the debt, and the reforms needed. Nor has it sorted out further loans which at most serve to pay the interest on the debt and certainly don’t improve the living conditions of workers and pensioners. Four days after the polls closed, Tsipras had to pick up the hot potato and propose to the Troika more than the Troika itself had initially demanded in terms of reforms and cuts. The programme includes a 12 billion euro "financial package" involving the raising of the retirement age, the suspension of VAT relief to the islands and a general increase in taxes. The increase in the retirement age means that unemployment will rise, especially among young people. The tax increase will again affect the quality of life of all Greeks on fixed incomes, of course for those who have them. The cancellation of the VAT facility for the islands is in fact an increase in VAT for business and tourism operators. Its impact will be an increase in consumer prices for both tourists and locals. The only sweetener is that Tsipras has vowed to harass the super rich a bit more and make the bosses pay taxes (but only in moderation). All this just to get funds from the "torturers" of the Troika to avoid immediate collapse and to cultivate the weak opportunity to renegotiate a debt which everyone knows cannot be paid, neither in the short term, nor perhaps ever. But it is useful for large creditors who can exert economic blackmail over future orders, and the possible purchase of "the family silver" as privatisations will open up new opportunities for the vultures of international finance. These are the immediate consequences of the victorious NO campaign in the referendum. Then there are other considerations. The referendum has ended up being on one side, a confidence vote for the government, and on the other a nationalist and conservative political exercise which managed to fill the squares with the blue-white Greek flag in a patriotic outpouring against German arrogance. Not a word against the national bourgeoisie, the bosses who don’t pay taxes: Tsipras limited himself before the referendum to proposing a "one-off" tax the on the super-rich. This, however, was rejected by the Troika as too dangerous for big capital, especially the financiers, who, at the time of the Greece’s entry of into the euro, falsified the accounts in collaboration with one of the leading international financial parasites (Goldman Sachs – translator’s note), which helped to make the domestic economic situation even worse after the subprime crisis burst. The referendum has however succeeded in diverting the attention of the Greek masses from the domestic bourgeoisie’s responsibility instead concentrating on those abroad. It was clear from the start that the referendum was pointless, that things would remain the same as before, but calling for an unworkable NO to the policy of austerity would, at least in the short term, keep the streets under control within the nationalist, bourgeois and capitalist framework, with no hope of a future alternative to the system. And so it turned out. A revolutionary position which aimed to pose a small alternative voice to the fake referendum of the national bourgeoisie, should, first of all, have explained why a referendum was called, what its real aims were and what the consequences would be. That’s got to be the starting point, not because the referendum itself had any intrinsic meaning, or because there was an opportunity to even minimally change the terms of austerity or the debt repayments. The fact is that the party in power, operating on a bourgeois nationalist terrain, was aiming to confuse the political consciousness of the workers further with more false promises and illusions. Their strange economic and financial proposals led nowhere except to the bourgeois preservation of the capitalist system, with the added insult that this was dressed up as something radical. Defining the nature, the purpose, and the trap which the referendum represented was the necessary first step from which to get to the second fundamental concept, the need for the revival of the class struggle. In this case, in the specific Greek situation the call for the need to resume the class struggle has to be put alongside the denunciation of the referendum, if we don’t want it to fall from the sky like some "UFO". YES to the revival of the class struggle has to be the logical consequence of the denial of the objectives of the referendum. In short, YES to the class struggle had to be linked to NO to the referendum. The bourgeois game of YES and NO to an austerity policy that everyone (Tsipras above all) knew was coming had to be rejected. Before any line of action could be put forward the veil had to be torn aside and the trick exposed. To appeal instead for the resumption of the class struggle without exposing the deception of the referendum, without denouncing its objectives of preserving the system and harnessing the working class to that goal, was at the very least a tactical error. And if the need for resumption of the class struggle is based on "tactically" accepting a NO vote then we are in open contradiction. It’s a very confused way of posing things to the masses, because the two paths are difficult to reconcile if not in a hybrid and contradictory form: "if you accept the referendum and go vote, then vote NO because the only solution is the class struggle". The class struggle not only cannot come from the referendum, which is its negation, but has to distance itself from it from the beginning. It is best to be clear and direct in policy formulation: you thus avoid misunderstandings and give understandable and unambiguous messages. It might be argued that the "hybrid" formulation contains another message, which says, "we must be able to be adaptable, tactically smart, and not cling to formulas, which are correct in themselves but difficult to deploy". Right, but tactical intelligence lies in the ability to find the correct political formula to expose the system and to alter it. Worse still, to put it partially or incorrectly and in a contradictory way does not increase its clarity or its purpose in propaganda terms. It would just be a dangerous step towards the lowest common denominator which could take us to the brink of opportunism. We cannot avoid isolation (if this was the main worry, which, in itself, should not be part of the make-up of a revolutionary organisation) by watering down our political positions, but have to put them forward starkly and clearly, otherwise we run the risk of tail-ending the current political backwardness of the masses, and we would get stuck there, first with just one foot, then one leg and, in the end, with the whole body. Tactical intelligence is something else. It makes any policy understandable with the required communication tools, the right analysis and the resulting slogans, but within a correct political framework that does not change from time to time with contradictory and confused positions close to the border of opportunism. An interesting article relating context and practice which I want to full support. I do not think that voting in bourgeois elections can ever be seen as a tactical issue. For left communists this is surely a principle (or perhaps a moral issue as the ICC would put it). However I don’t think participation as a voter or as candidate necessarily puts someone outside the wc movement eg SPGB. From the basis that this is a class society and that capitalism now stands in the way of the development of humanity towards a genuine free and equal society, ie communism, then surely we must say that we don’t make or contribute to decisions by the ruling class as to how capitalism is run in its decline. This must apply not just to the electoral circus around which party runs the state apparatus at any given point in time but also to referendums or whatever circus the bourgeois dreams up to facilitate its social control. I am interested however to hear how far other comrades would take this view. I dont vote in elections or referendums and I don’t vote in local elections or police chief elections or building society AGMs or whatever. I am happy to discuss and have an opinion about elections and how the results are likely or do impact on society hence I have personal opinions about Scotland being in the UK and the UK being in the EU but this is just personal and not political. I would also apply this approach to any internal TU votes including obviously TU official elections but also to votes at local branch meetings even when disputes were being discussed. I have taken the approach that I would only take part in open votes at mass meetings. This is a trickier issue than merely saying participation in elections and voting is a question of principle. In fact you fall foul of that in your comment. If it is a question of principle how can the SPGB be "inside the working class movement" as you suggest it does? The fact is that it is about means and not about principles (which are about ends). Now of course there are some means which have to be ruled out because the conflict with the ends that we hope to attain. Taking part in elections is not necessarily one of those but on one level it could be. Socialism/Communism has to ACTIVELY involve the mass of the class. Elections tend to be the opposite - reducing working class activity to passively suporting this or that organisation. However we cannot rule out the possibility that at some point an election will take place in a different context (although it is increasingly difficult to envisage one). Somewhere on the site is a translation of Onorato Damen's take on this. He always argued that abstentionism was not a principle and argued too that Bordiga was in error to put the call for abstentionism before the call for forming a communist party (since it divided potential communists and delayed the appearance of the party in Italy until 1921). In 1948 the PCInt stood candidates in the elections BUT only because that gave them the right to speak in public squares to the working class directly about the capitalist system. At the same time they gave out leaflets calling on people not to vote. Damen hints that this was unique and that perhaps the situation will never arise again but remains clear that it is a tactic and each case has to be judged on the merits of whether it advances the cause of the class. As I said tricky. Anyway thanks for the contribution on a significant issue.